On her 99th birthday, a longtime client of Nails & Co. Spa came in for her usual manicure and pedicure. The salon erupted with every single nail tech, client, and receptionist singing “happy birthday to you!” Nails & Co. Spa’s owner Alexis Nguyen presented the client with a cake and gifts while tears of happiness trickled down her face. “We’re a family,” Nguyen explains. 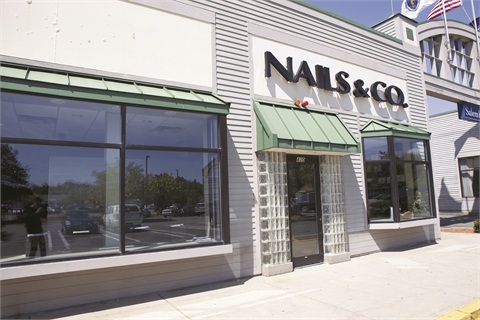 Nails & Co. operates at six locations throughout Massachusetts. While each location differs from the others in design, each one displays Nguyen’s passion for the beauty industry, her appreciation of her employees, and her obsession with salon upkeep. “What makes clients so addicted is that we go the extra mile,” Nguyen says. When a bride requested a nail color the salon didn’t have for her upcoming wedding, Nguyen worked with Misa Cosmetics to invent the color. She sent a piece of the fabric and Misa sent a bottle that matched. “It was our gift to the bride,” Nguyen says. Nail services range from manicures and pedicures to aromatherapy nail treatments. The most popular service is acrylic nails, especially in the Burlington location that serves a majority of career women. Prices start at an affordable level for basic services. “Clients can then choose add-ons including massages and masks as they wish,” Nguyen says. Unlike other nail salons, Nails & Co. targets the root of problem areas for clients with services that offer healing rather than a quick fi x. “We ask clients what their lifestyle is like and educate them on how to take care of their bodies,” Nguyen says. Nguyen aims for her clients to be balanced with the yin and yang and incorporates herbs and natural ingredients into the salon’s treatments to do so. From the HydraFacial or tropical de-aging treatment to the reflexology massage or hot stone massage, the salon’s services renew energy and inner peace. “We have a lot more to deliver, but if the consumer doesn’t ask we won’t know to answer,” Nguyen says. Although Nguyen no longer sees clients, she remains in the human resources department, as well as the education department of her business. Nguyen educates her employees so they can educate the clients. Each location has a silent partner on site, manager, assistant manager, and two front desk receptionists. 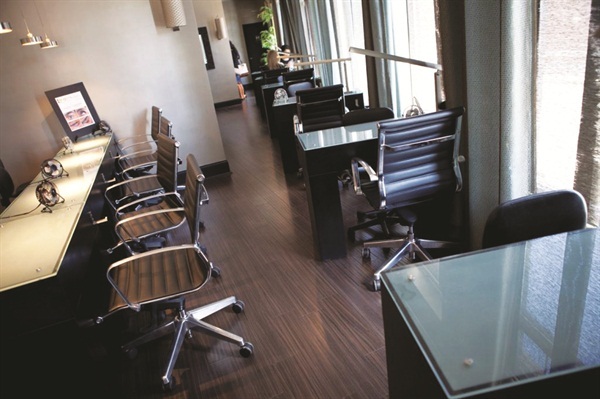 The number of nail techs at each salon ranges from 15 to 25. One requirement Nguyen has for her partners and managers is they must have worked with her in the past, understand her philosophy, and stand behind the beliefs of the salon. Techs, on the other hand, come straight to the salon from school. Students practice removing calluses on cucumbers by stripping away the green skin without the white showing. Nguyen explains that the cucumber helps techs control their aggressiveness. Nails & Co. allows the nail techs to choose from salary or commissioned pay. “Most single techs like to be on commission while techs with families prefer salary because it comes with benefits,” Nguyen explains. Every month managers sit down with the nail techs and go over their strengths and weaknesses. Nguyen says it helps them find solutions to any problems and it educates the techs on both customer service and technical trends in the industry. Previous employees remain in contact with Nguyen and use her as an educational resource for advice. Nguyen takes pride in her salons’ decor. Each one is created to fi t whatever mood she is in at the moment. Decorated with chandeliers and crystals, the Beverly location is more feminine, while the Swampscott location is more dominant with modern details mixed with a Japanese theme. The West Peabody location has more of a Malaysian look. When decorating the Burlington location, Nguyen kept her clients in mind. “I know that my clients in Burlington like to travel a lot so the salon resembles a hotel lounge,” Nguyen says. 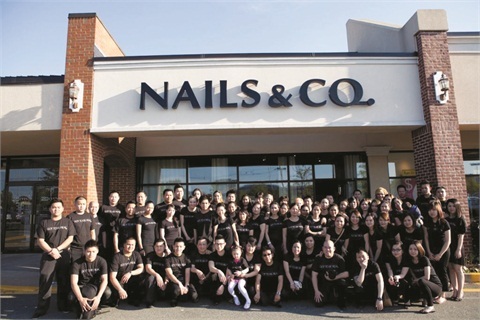 While they each have their own unique decor and theme, Nails & Co. salons all contain Asian qualities to represent Nguyen’s culture. “Every time we would announce we have a new location everyone would pour in to see the new decor,” she says. Nguyen chooses the location of her salon based on the needs of her clients. “Several of my clients are real estate brokers so when they see an opening in an area that is ideal for the salon’s clientele, they lead me to it,” she says. Each location is in a plaza with surrounding stores that are convenient for clients. The six locations are approximately a half hour to an hour apart. Due to a high volume of referrals and good old word-of-mouth marketing, “Surprisingly, clients show up in other locations, as well,” Nguyen says. One of the clients who frequents the Burlington salon has a sister closer to another location, and they both prefer visiting each other’s neighborhood locations, according to Nguyen. Nguyen believes there is always room for extras. Her ultimate goal with Nails & Co. is to transform it into an alternative medicine day spa where clients can go to understand everything about the body. Locations: Beverly, Burlington, Natick, Norwood, Swampscott, and West Peabody, Mass.